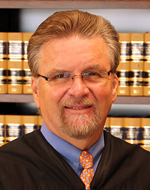 As reported in the DJ, Justice William W. Bedsworth of the 4th District Court of Appeal was awarded the annual Judge Franklin G. West Award at the Orange County Bar Association’s Judges’ Night and Annual Meeting on Jan. 25. Really the only remarkable thing about this is that Beds did not already have OCBA's highest honor! In more Beds news, see the MetNews for C.A. Denies Publication Request; Bedsworth Laments Flood of Reported Decisions. In other 4/3 news, Friday's DJ also featured an article by Justice Moore, Employing Veterans in California.